"Toy: Play House Nurse Doll - 2" by Normadeane Armstrong Ph.D, A.N.P. This is a Play House nurse doll produced by Jaret and Diamond of New York City. 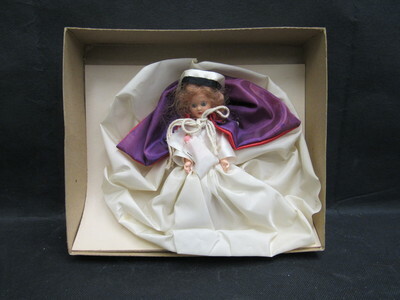 The doll features a plastic body, white dress and cape, and a purple/red silk cape. The box identifies the doll as no. 29 Nurse (e), and was marked for sale at $1.98.